Contrary to claims made by some commentators recently, there is little evidence, except for one state, that there are big shifts taking place across the electoral playing field in the race between Hillary Clinton and Donald Trump. This is based on comparing the 2012 results with the 32 states with 2016 presidential polls conducted since March. I used the RealClearPolitics average or, where there was no average, just the results of most recent poll(s). There is one very big outlier here: Utah. 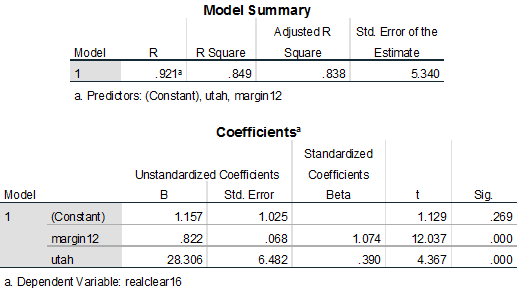 If you take out Utah, the R-squared goes up from .74 to .84. But the bottom line here is that there is a lot of consistency between the 2012 results and the 2016 polling. And that’s despite the fact that some of these polling results are undoubtedly somewhat off the mark — for example, I strongly suspect that the estimates for Clinton’s margins in California and New York are too low. When we get the actual election results, I am very confident that the correlation will be stronger. Without Utah, the average Clinton margin across all of these states is 4.3 points. 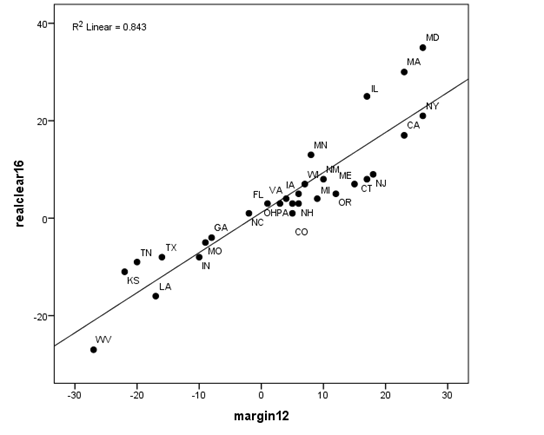 Obama’s average margin in these states in 2012 was 3.8 points. When the data are weighted by state population, the average margin across these states is 6.7 points vs. 6.3 points for Obama in 2012 — so these are a somewhat more Democratic group of states than the entire country. That’s because there is no polling data available for many smaller states which tend to be Republican-leaning. But the data clearly indicate that thus far, Clinton is doing slightly better than Obama did in 2012. 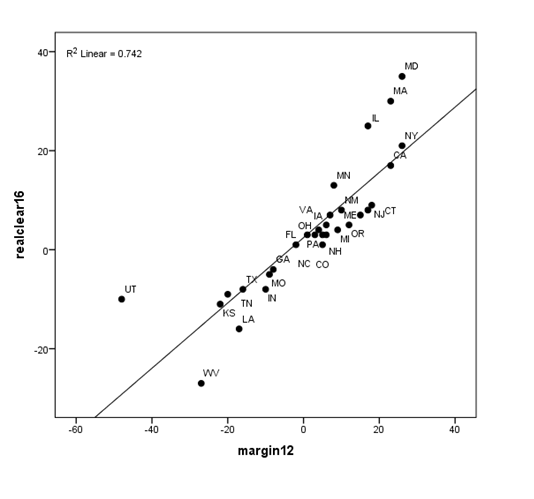 So there is no evidence of a big swing in either the overall margin or the pattern of support across these states.